London, UK: Octopus Books, 1973. Text/As New. Illustrated coffee-brown boards/NF w/trace upper/lower edge rubs. DJ/NF w/light wear. Photographic essay of edible mushrooms and fungi. Contents in 7 sectors: 1, Introducing Fungi; 2, Edible Mushrooms; 3, More Edible Mushrooms; 4, Poisonous Fungi; 5, Toadstools; 6, Strange & Sinister Fungi; and, 7, Bracket Fungi.. First Edition, First Thus. Hard Cover. Near Fine/Near Fine. Beaverton, OR: Touchstone Books, 1972. Text/BRAND NEW & Bright. Illustrated soft cover/NF, w/trace creasing to lower front corner & trace discoloration. Guide to some 180 wildflowers, plants and shrubs for travellers visiting the Cascade Mountain regions. Emphasis on habitats and environments. Majority illustrated w/color photos; simple & direct approach to identification. Fine copy.. First Edition, First Thus. Soft Cover. Near Fine/None as Issued. New York, NY: Arcade Publishing, 1989. Stated First U.S. Edition. Text/BRAND NEW. Gilt embossed green linen boards/Fine. DJ/Fine but price clipped. Illustrated endpapers. 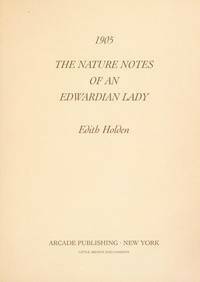 A 1905 journal kept by naturalist and artist Edith Holden (1871 - 1920). while living in Knowle, Warwickshire, a county of central England. Professionally, Edith Holden illustrated books; the watercolors adorning this book illustrate her responses to seasonal changes in nature. The Journal, precedes her well known The Country Diary of an Edwardian Lady by one year. Written while residing at Knowle, Warwickshire (a county of central England), the work is a record of birds, insects and other animal life and those plants, shrubs and trees nature provided for their sustenance in that region. Unlike The Country Diary, Holden's handwritten notes were written in draft; for legibility, they were set in type for publication.. First U.S. Edition, First Thus. Hard Cover. Near Fine/Near Fine. Washington, D.C.: Department of the Army, 1957. Published October, 1957. Text/trace soiling to fEP, else Near New. Beige soft cover/VG; strong & sound w/soiling & PO name to upper right corner. PO name stamped on front & rear covers verso & upper/lower leading edges. Fold-out map of world deserts/BRAND NEW. Field manual prepared for isolated soldiers and having to find water, food, and shelter while making it back to friendly forces. Basic skills in map reading, directional guides, first aid, sanitation; how to travel, find water and identify edible plants. Very useful for civilian use, this outstanding publication has been translated into other languages and reprinted as recently as 2002 for general consumption. Strong copy.. First Edition, First Thus. Soft Cover. Very Good/None as Issued. New York, NY: Alfred a Knopf, 1980. Text/BRAND NEW. Orange faux-leather flexible cover/Fine. Book issued with half-size illustrated banner/None. First field guide to present mammals in full-color photographs rather than in paintings. Intended for field use, volume includes all land-dwelling and land-breeding mammal of North American north of Mexico. Fine copy.. 9th Printing of 1993. Soft Cover/Flexible. Near Fine/None as Issued.